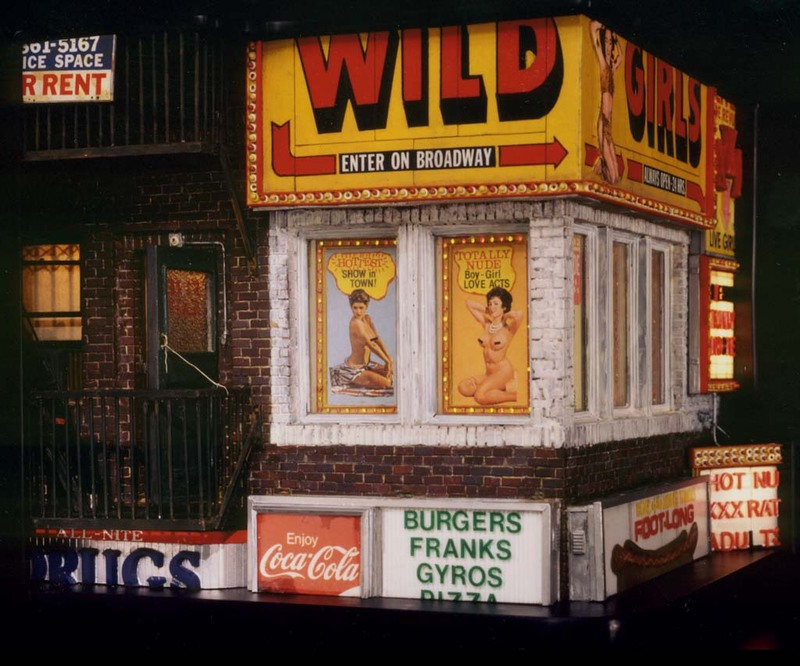 This fictional Times Square-esque environment is loosely designed after some of the elements of the 1987 Follies Burlesk piece. The partially open door on the fire escape reveals a view into the backstage area. A peek in takes you down a darkened corridor leading to a flight of steps down to the stage. Doors to dressing rooms line the walls and a Pepsi machine is visible. Looking off to the right side, you can see into one of the dressing rooms. The tiny room is crowded with a sink, lighted mirror and various articles of clothing strewn about. On the makeup table sits a pink teddy bear and a picture of the boyfriend who gave it to the star performer.